"description": "Writer and a technology enthusiast from Melbourne, Australia working at itCraft in Poland. He writes IT related content, researched with industry professionals, for passionate audience interested in mobile app and software development." 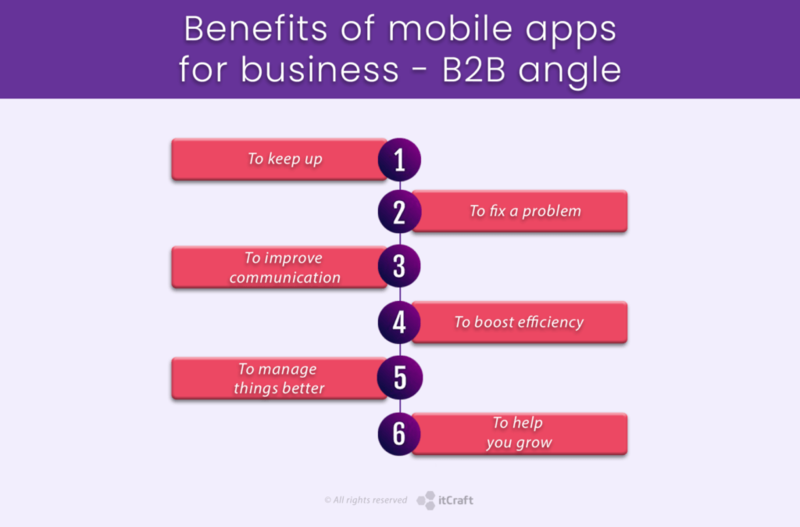 "description": "6 Reasons why your business needs bespoke mobile app ➤ Find out how your business can accelerate after the implementation of mobile solutions ➤ Read now!" When does it make sense for your business to create a custom mobile application? Why your large or small business needs mobile? 6 reasons to introduce innovation within your company. The commercial value of mobile apps is unquestionable. Brand awareness, online sales, easy access to services – all these benefit from dedicated business mobile apps. Nothing better for your business than getting into everyone’s pocket, and that’s where their smartphones are. This, actually, is no rocket science. Some 5 billion people around the globe are currently in possession of a mobile phone. Some would say that most of them seem possessed by them. Good for everything, aren’t they? Read the news, call your mom, buy a rubber chicken, or find a date – all at your fingertips. Mobile apps for all kind of problems and purposes. So can we really speak of addiction here? No, we can’t. Humanity may be addicted to mobile phones. You and I just use it as a tool to do important stuff – so important that we tend to forget the real world and real people in it. Well.. once you broke some eggs, better make an omelet out of them, eh? To the point though. You’re running a business – a nice, small, medium or a large company with lovely people, great management and amazing outlooks. Good on you. Looks like you don’t really need to improve, develop or grow. Or do you? M-commerce, games, entertainment, social media, useful apps – easy pickings. Google it. All the advantages, disadvantages, benefits and tips of going mobile here have been mulled over and analyzed a million times. Brand awareness, customer engagement and satisfaction, increasing sales and visibility, are all at you and your customers’ fingertips, all thanks to mobile phones. Push notifications or loyalty programs help improve customer experience and build brand of small and midsize businesses as well as larger companies. Instead, let’s talk about what mobile apps can actually change for you and your business internally, not just your (all hail them anyway) customers. Why then? Why would you need a custom software solution? It’s 2019 for heaven’s sake. Everyone is mobile now. You can’t just continue on with paper documentation, plain phone communication, or daily work schedules stuck to the wall. I mean you can, many still do, but it won’t get you far. Internal processes must be streamlined to fit in today’s market and for your business to remain competitive. Somehow, traditional business processes don’t sound all that up-to-date to me. Nowadays, time is always of the essence. The quicker you can get something done, retrieve information or communicate something in your company, the more time you save for (more) important stuff, and the fewer people you need to hire to manage it. And isn’t it all about lean these days? As they say “keep your business lean to keep your wallet fat” (no one really says that… yet). So, if you don’t want to be left behind, think innovation. Mobile & web apps are exactly what you need. For businesses of all sizes, a solution can be either found or developed. It all depends on what you need. One sure thing is, you do need something. Issues with a company’s internal processes are not uncommon. The nature of those issues, the variety, severity – that’s a whole different story. You can be battling anything from underperforming employees, through disorganized management, all the way up to yourself losing the sense of purpose. And, of course, everything in between. Before you laugh.. no, mobile apps are not a cure for all your pains. Nor is mobile so easily applicable to any and all problems. But for a business owner with a vision and a clear understanding of what’s needed for improvements, mobile innovation can definitely be a solution to consider. How do you know though? Easy. Identify an issue you’re having, let’s say “now, where’s all this paperwork coming from? Who’s got time to read it, file it, summarize it etc…?” there, problem identified. You got too much paperwork to handle efficiently by hand. You need a solution. Best option? Digitize it. How? Here’s a pickle. Is it typical documentation? Any handwritten bits? Maybe it’s all just yes/no answer type of reports. While off-the-shelf products can handle typical and general – when it comes to non-standard documents or internal exchange of them, things get a bit tricky. This is where custom software can be a real lifesaver. Talk to developers from mobile app development company. Tell them what you need, or rather what your issue is and they will either offer to propose a solution or take your idea (if you have one) and turn it into digital reality and simply they create a bespoke mobile or web application for you. Internal communication is the nervous system of your company. Yelling across the office sounds a little outdated, and there’s more to communication than just talking. Emails, calls, chat, sending documents and files or interconnecting between multiple offices – all these are a part of everyday office activities. Some companies get stuck in their conservative ways and introducing new standards is more like “we’ll get it when we have to”. If you turn to innovation and digital solutions instead (application available at www.slack.com is one off the shelf option), you can really make a difference. Developing a totally custom, tailor-made software for mobile devices to address specific communication needs of your business is sure to make a difference. The effects will be best if you include the needs and input from as many of the people involved as possible. Run a survey among all your employees asking them what they need, want, have an issue with, and based on that, start working on a solution. Custom built software can fix a range of efficiency problems your business is facing. A good example is combining various, typically standalone services into one application. For example, putting emails, internal real-time communication (read more about custom real-time chat application), storage and exchange of documentation, announcements, and directives into one comprehensive system could save you a lot of time, that is currently spent on copy/pasting stuff from one service to another. A properly designed application will give a swift ROI in the form of your team’s smiles and nods of appreciation as well as more tangible effects – a significant reduction in time required to perform certain tasks. Managing shifts, replacements, assigning tasks, time reporting, clocking in/out – all these can easily be done manually. Well, as long as it’s not all of it at the same time and when we’re talking a relatively small number of employees. If you’re running something big and complicated, like an aged care facility or a factory, keeping track of all your employees’ comings and goings, task assignment/fulfillment, unexpected absences etc.. is neither easy nor cheap. Work management is where the benefits of mobile software solutions really shine. A mobile app covering all the above functionalities, allowing you to create reports based on any data gathered by the app (like this baby – Supracare) will prove a real treasure. Heck, it might even let you fire a manager or two – how fun is that? Upscaling, creating new departments, hiring more people, increasing output are all natural parts of every business. Obviously, you will want them properly managed and controlled. You can either look for off the shelf solutions, like the notorious SAP platform or develop custom mobile or web application. If you decide on the latter, you will not only avoid entangling yourself in a long term commitment of paying the license fee but most importantly, you will be able to create a solution that will be truly your own. You will be able to address your needs as they are, instead of trying to adjust existing solutions to your requirements. With a good mobile app developer, you will be able to start long term cooperation having your system not only created to address your needs of today but also continuously supported and maintained to remain up to date and relevant through mobile app lifecycle. Working with an app developer is a very rewarding experience, given you choose the right people to partner with. Introducing mobile innovation into your business will require exactly that – a partnership. To have complete oversight over your product, you will be establishing lasting cooperation with a software house. With your insight and direction you will enable them to create a solution perfectly adjusted to your business needs. The mobile innovation trend is here to stay and according to any and all market research it is making a huge difference for businesses both in customer relations and internally. The sooner you start your mobile adventure the more you get out of it. Is React Native the ultimate Holy Grail of mobile app development?